Discover how RavenDB powers uCommerce, an e-commerce platform for .NET tightly integrated CMSs Umbraco and Sitecore. Helping customers find the product they're looking for is one of the biggest challenges in e-commerce: Learn how uCommerce integrates RavenDB and its faceted search capabilities into the core platform to solve this challenge. One of the problems with memory mapped files is that you can’t actually map beyond the end of the file. So you can’t use that to extend your file. I had a thought and set out to check, what will happen if I create a sparse file, a file that only take space when you write to it, and at the same time, map it? And then we can do stuff to it. And that include writing to yet unallocated parts of the file. This also means that you don’t have to worry about writing past the end of the file, the OS will take care of all of that for you. Happy happy, joy joy, etc. One problem with this method, however. It means that you have a 64Gb file, but you don’t have that much allocated. What that means in turn is that you might not have that much space available for the file. Which brings up an interesting question, what happens when you are trying to commit a new page, and the disk is out of space? Using file I/O you would get an IO error with the right code. But using memory mapped files, the error would actually turn up during access, which can happen pretty much anywhere. It also means that it is a Standard Exception Handling error in Windows, which require special treatment. To test this out, I wrote the following so it would write to a disk that had only about 50 Gb free. I wanted to know what would happen when it run out of space. That is actually something that happens, and we need to be able to address this issue robustly. The kicker is that this might actually happen at any time, so that would really result is some… interesting behavior with regards to robustness. In other words, I don’t think that this is a viable option, it is a really cool trick, but I don’t think it is a very well thought out option. By the way, the result of my experiment was that we had an effectively a frozen process. No errors, nothing, just a hung. Also, I am pretty sure that WriteArray() is really slow, but I’ll check this out at another pointer in time. Voron, LMDB and the external APIs, on my! One of the things that I really don’t like in LMDB is the API that is exposed to the user. Well, it is C, so I guess there isn’t much that can be done about it. But let look at the abstractions that are actually exposed to the user by looking how you usually work with Voron. This is a perfectly nice API, it is quite explicit about what is going on, and it gives you a lot of options with regards to how to actually make things happen. It also gives the underlying library about zero chance to do interesting things. Worse, it means that you have to know, upfront, if you want to do a read only or a read/write operation. And since there can be only one write transaction at any given point in time… well, I think you get the point. If you code doesn’t respond well to explicit demarcation between read/write, you have to create a lot of writes transaction, essentially serializing pretty much your entire codebase. Now, sure, you might have good command / query separation, right? So you have queries for reads and commands for writes, problem solved. Except that the real world doesn’t operate in this manner. Let us consider the trivial case of a user logging in. When a user logs in, we need to check the credentials, and if they are wrong, we need to mark it so we can lock the account after 5 failed tries. That means either having to always do the login in a write transaction (meaning only one user can log it at any time) or we start with a read transaction, then we switch to a write transaction when we need to write. As you can see, we make use of snapshots & write batches. Those are actually ideas taken from LevelDB. A write batch is a set of changes that we want to apply to the database. We can add any number of changes to the write batch, and it require no synchronization. When we want to actually write those changes, we call Writer.Write(). This will take the entire batch and apply it as a single transactional unit. However, while it will do so as a single unit, it will also be able to merge concurrent calls to WriteBatch into a single write transaction, increasing the actual concurrency we gain by quite a bit. The expected usage pattern is that you create a snapshot, do whatever you need to do when reading the data, including maybe adding/removing stuff via a WriteBatch, and finally you write it all out. We can optimize concurrent writes. We don’t have to decide in advance whatever we need to read only or read / write. Speaking of unfair interview questions, this would be a pretty evil one. Can you see the bug? And how would you fix it? What is your control group? One of the areas that where we think Voron can be improved is the free space utilization policy. In particular, smarter free space utilization can lead to better performance, since we won’t have to seek so much. I spent some time working on that, and I got something that on paper, at least, looks much better, performance wise. But… actual benchmarks showed little to no improvement, and in some cases, actual degradation! That was the point when I realize that I actually needed to have some sort of a control, to see what would be the absolute optimal scenario for us. So I wrote a null free space policy. With no free space, Voron will always go to the end of the file, giving us the best case scenario of sequential writes. In other words, pretty much the entire time was spent just calling FlushViewOfFile. However, I think that we optimized that enough already, didn’t we? Looking at the calls, it seems that we have just one FlushViewOfFile per transaction in this scenario. So seeks wise, we are good. What I can’t understand, however, is why we see those ReadFile calls. Looking at the data, it appears that we run into this whenever we access now portion of the file, so this is the mmap subsystem paging the file contents into memory before we start doing that. It is actually pretty great that it is able to page 1 MB at a time. Next, let us see what else we can do here. I run the 500 tx test on an HDD drive. And it have given me the following results. But note that each write has two writes. One at the end of the file, and one at the file beginning (which is the actual final act of the commit). What happened if we just removed that part? Now, this is a meaningless test, added just to check what the relative costs are. We have to do the header write, otherwise we can’t do real transactions. 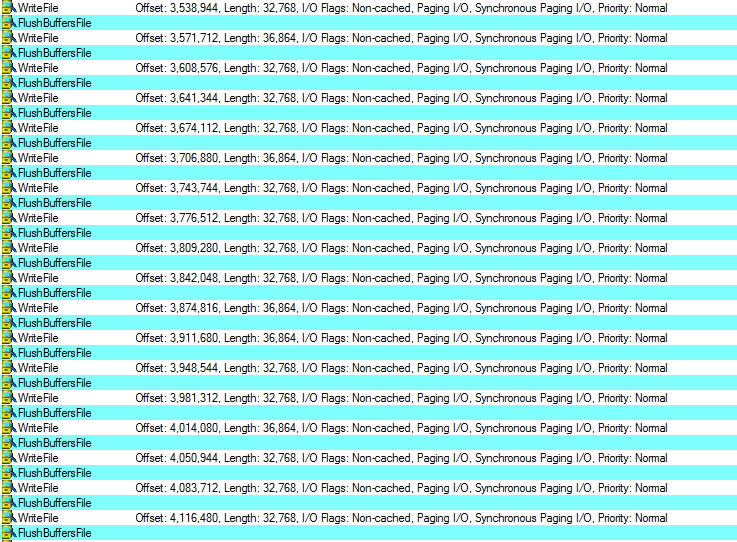 As you can see, we only have to write 8 – 10 pages per transaction, compare to 110 – 130 in the random case. And that obviously has a lot of implications. All of this has thought me something very important. In the end, the actual free space policy matters, but not that much. So I need to select something that is good, but that is about it. One of the worst things that can happen to you professionally is stagnation. You know what you are doing, you know how it works, and you can coast along very easily. Unfortunately, there is the old, it isn’t what we know that we don’t know that is going to hurt us. It is what we don’t know that we don’t know that is going to bite us in the end. One of the reasons that I have routinely been going out and searching for difficult codebases to read has been to avoid that. I know that I don’t know a lot, I just don’t know what I don’t know. So I go into an unfamiliar codebase and try to figure out how things work over there. I have been doing that for quite some time now. And I am not talking about looking at some sample project a poo schlump put out to show how you can do CQRS with 17 projects to create a ToDo app. I am talking about production code, and usually in areas or languages that I am not familiar with. CouchDB (to learn Erlang, actually, but that got me to do DB stuff). Those are codebases that do interesting things that I wanted to learn from. Indeed, I have learned from each of those. Some people can learn by reading academic papers, I find that I learn best from having a vague idea about what is going on, then diving into the implementation details and seeing how it all fits together. But the entire post so far was a preface to the question I wanted to ask. If you are reading this post, I am pretty sure that you are a professional developer. Doctors, lawyers and engineers (to name a few) have to recertify every so often, to make sure that they are current. But I have seen all too many developers stagnate to the point where they are very effective in their chosen field (building web apps with jQuery Mobile on ASP.Net WebForms 3.5) and nearly useless otherwise. So, how are you keeping your skills sharp and your knowledge current? What have you been learning lately? It can be a course, or a book or a side project or just reading code. But, in my opinion, it cannot be something passive. If you were going to answer: “I read your blog” as the answer to that question, that is not sufficient, flatterer. Although, you might want to go a bit further and consider that imitation is the sincerest form of flattery, so go ahead and do something. “Hibernating Rhinos is committed on developing and marketing a first class document database and wants its customers to get the best experience out of it, so we’re glad having Managed Designs assisting them” said Oren Eini, CEO of Hibernating Rhinos. “Managed Designs has been enjoying RavenDB for years now, and we’re excited to have been engaged by Hibernating Rhinos in order to have their customers getting the best experience out of the product”, said Andrea Saltarello, CEO of Managed Designs. RavenDB is a registered trademark of Hibernating Rhinos and/or its affiliates. Other names may be trademarks of their respective owners. Voron is the code name for another storage engine that we are currently trying, based on LMDB. After taking that for a spin for a while, it is not pretty complete, and I decided to give it some perf test runs. So far, there has been zero performance work. All the usual caveat applies here, with regards to short test runs, etc. Just like before, we found that this is horribly slow on the first run. The culprit was our debug code that verified the entire structure whenever we added or removed something. One we run it in release mode we started getting more interesting results. None means no flushing to disk, let the OS deals with that completely. Buffers means flush to the OS, but not to disk, and full means do a full fsync. Now, this is pretty stupid way to go about it, I’ve to say. This is doing everything in a single transaction, and we are actually counting the time to close & open the db here as well, but that is okay for now. We aren’t interested in real numbers, just some rough ideas. Now, let us see how we read it? 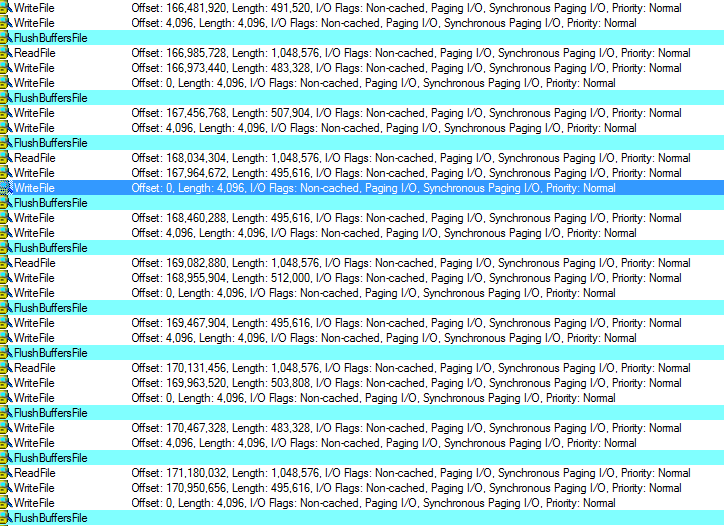 And again, this is with opening & closing the entire db. We could do better with pre-allocation of space on the disk, etc. But I wanted to keep things realistic and to allow us to grow. We get a 2x perf improvement from running on two cores, running on 4 threads require some dancing around, which caused some perf drop, then we see more time spent in thread switching than anything else, pretty much. As you can see, we see a really pretty jump in performance the more cores we use, until we reach the actual machine limitations. So far, I am pretty happy with those numbers. What I am not happy is the current API, but I’ll talk about this in a separate post. As I mentioned, one of the things that I have been working on with Voron is optimizing the sad case of random writes. I discussed some of the issues that we had already, and now I want to explain how we approach resolving them. With LMDB, free space occur on every write, because we don’t make modifications in place, instead, we make modifications to a copy, and free the existing page to be reclaimed later. The way the free space reclamation work, a new page can be allocated anywhere on the file. That can lead to a lot of seeks. With Voron, we used a more complex policy. The file is divided in 4 MB sections. And we will aggregate free space in each section. When we need more space, we will find a section with enough free space and use that, and we will continue to use that for as long as we can. The end result is that we tend to be much more local in the way we are reusing space. So we improved on the seeks / tx, but got worse on the size / tx. That is probably because of the overhead of keeping the state around, but it also relates to some tunable configuration that we added (the amount of free space in a section that will make it eligible for use. 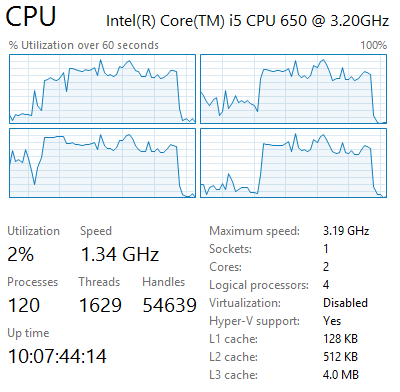 Annoyingly, after spending quite a bit of time & effort on this, we don’t see a major perf boost here. But I am confident that it’ll come.